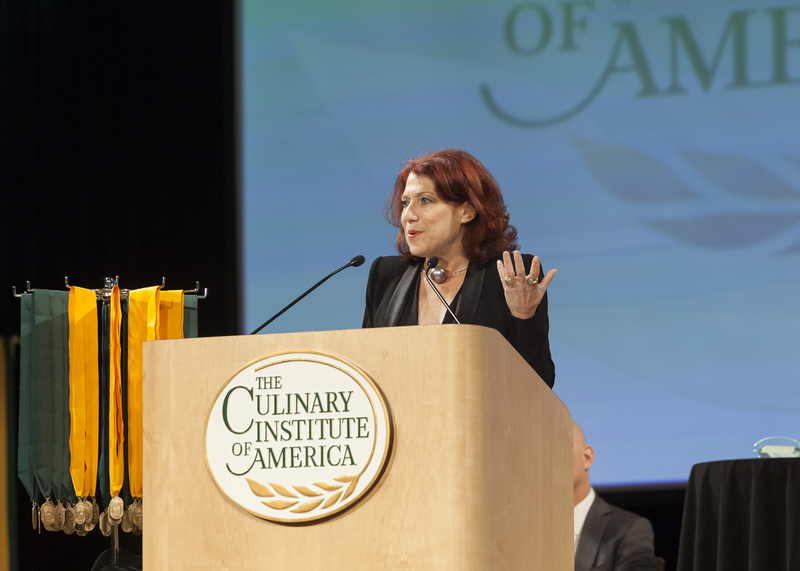 Hyde Park, NY – Marcy Blum, founder and CEO of Marcy Blum Associates, delivered the keynote address during commencement ceremonies at the New York campus of The Culinary Institute of America on September 25. A 1975 CIA graduate, Ms. Blum leads her New York City-based team in creating stylish and unique weddings and other special events. She has been named a “trendsetter” by Modern Bride and was selected to the Martha Stewart Weddings magazine list of the top 10 wedding planners in 2014. Ms. Blum is a recipient of the Legacy Award from the International Special Events Society. Her best-selling Wedding Planning for Dummies is now in its third edition. Her star-studded clientele has included Brad Pitt and Angelina Jolie, Billy Joel and Katie Lee, Kyra Sedgwick and Kevin Bacon, Padma Lakshmi and Salman Rushdie, Colin Hanks and Samantha Bryant, Nate Berkus, Tom Clancy, LeBron James, Regis Philbin, and the Rockefeller family. Ms. Blum spoke to 46 associate degree graduates in culinary arts and baking and pastry arts.